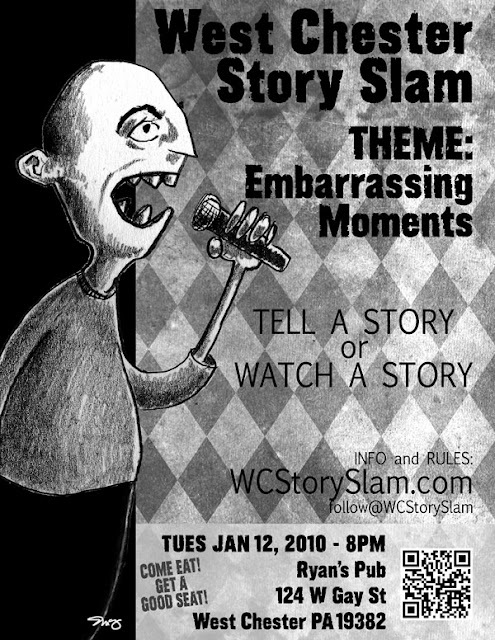 Jim Breslin, local Chester County writer and founder of the West Chester Story Slam contacted me through Twitter the other night asking if I’d be interested in helping put together a promo for the first public Story Slam event in January in West Chester. He wanted fliers/posters to put up around West Chester promoting the event. Drawing and designing late in the night, I tried a couple of different sketches and settled on this guy. Though he’s a little ‘fangy’ and Star Trek’y I think he does the job of showing a dude in the spotlight telling his tale. Funny that the theme of the event is “Embarrassing Moments”. After Jim posted the poster around the web, I went about writing this post and did a spit-take on it as I pondered my brother, the freelance financial copy writer‘s reaction to the piece. I noticed that I had misspelled “embarrassing” as “embarassing”. A quick fix and the original is now a collector’s item. I’m really looking forward to the inaugural slam for 2010 — from a watching perspective. Make sure to get to Ryan’s Pub early enough for a bite to eat and to get a good seat. In the meantime, look out for Jim with a bag full of fliers and a brush with a bucket of paste. This entry was posted in flier, poster, promo, story slam, west chester pa. Bookmark the permalink.